A complete secular (non-religious) psychoanalysis done by Gautama Buddha 2500 years ago. It has since been the essence of Chinese Ch'an (Japanese Zen) meditation. Pre-requisite: post secondary education (in English language). The Chinese texts used (as reference only) in this course were translated by Xuen Zhuang in the 7th century A.D. from Sanskrit. 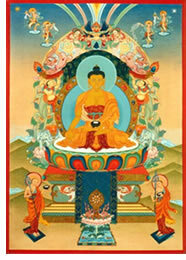 The English texts used (the studied texts) were translated by Chogyam Trungpa Rinpoche in about 1980 from Tibetan. Throughout the program, the interconnections of our Feeling, Perception, Consciousness and Formation with the External and Internal forms are examined. The 12 causes of creating Karma, The 8 sufferings, The 4 stages to attain Nirvana and their relationship to the concept of Emptiness will be discussed in detail.